This article originally appeared in MySweetCharity on April 15, 2019. For a second night in a row, the weather guessers lost their bets. On Saturday, March 23, there had been all types of threats (i.e., the usual thunderstorms, lightning, hail, tornadoes, end-of-world scenarios, etc.). But it all held off. Didn’t matter. The annual Equest gala fundraiser that had been held in years past at various outdoor venues like Dallas Equestrian Center and Texas Horse Park took flight and landed indoors at Sixty Five Hundred near Love Field. It was the first time at the former Wisteria outlet next door to Tesla for guests like Citation Awardees Connie and Denny Carreker and their neighbors Diane and Hal Brierley and Equest Mini-Ambassadors Cisco and Dare. Linda and Steve Ivy, who have bunked down elsewhere in recent months, smiled hopefully that they would finally be moving into their new high-rise digs in the Dallas Arts District the first of May. Previous plans to move earlier hadn’t been in the cards. 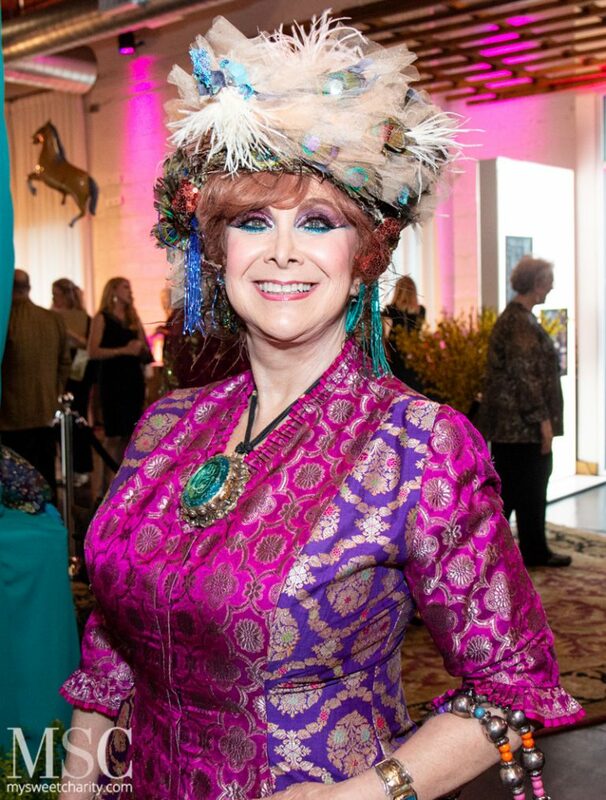 As the crowd of 500 gathered for the Arabian Nights-themed fundraiser, the place was decked out to fit the theme with Cisco and Dare in their Arabian best, accompanied by costumed Linda Robinson. The wee ponies were in competition with the mammoth green faux elephant for photo opps. Nearby, turbaned DJ Lucy Wrubel was in charge of the music, while guests checked out the silent auction. Near the entrance a fortune teller named Violette had guests like Linda Secrest shuffling cards to reveal their fates. 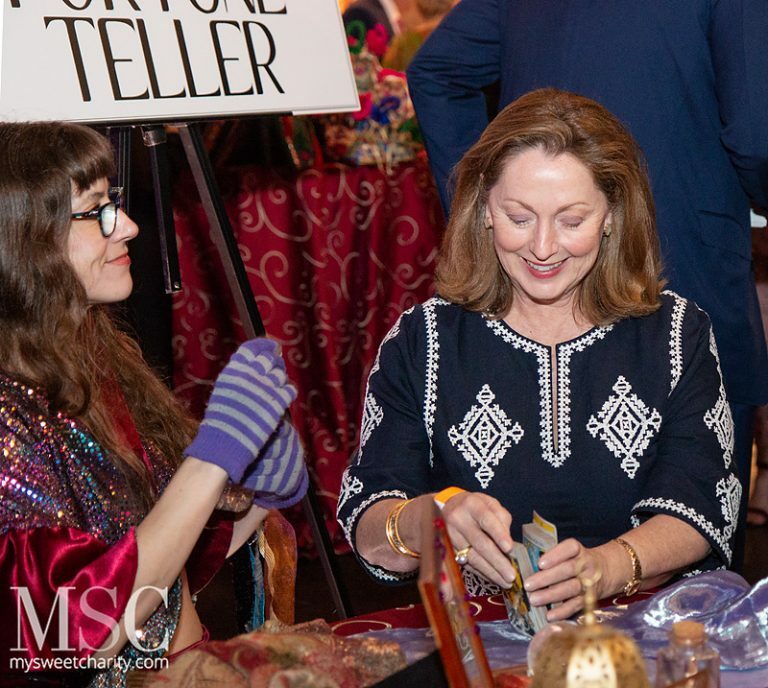 As WFAA/event emcee Sonia Azad joined Equest Women’s Auxiliary Founder Louise Griffeth and her son and daughter-in-law/Equest Gala Co-Chairs Annie and Teal Griffeth, someone remarked that the dolled-up pachyderm was the result of Annie’s handiwork. Late to arrive at the event was Griffeth family patriarch Guy Griffeth, who had fallen earlier in the day, resulting in a bandaged-up nose. Louise’s longtime friend, Dee King, had flown in from Wichita Falls to sub in for Guy until his arrival. 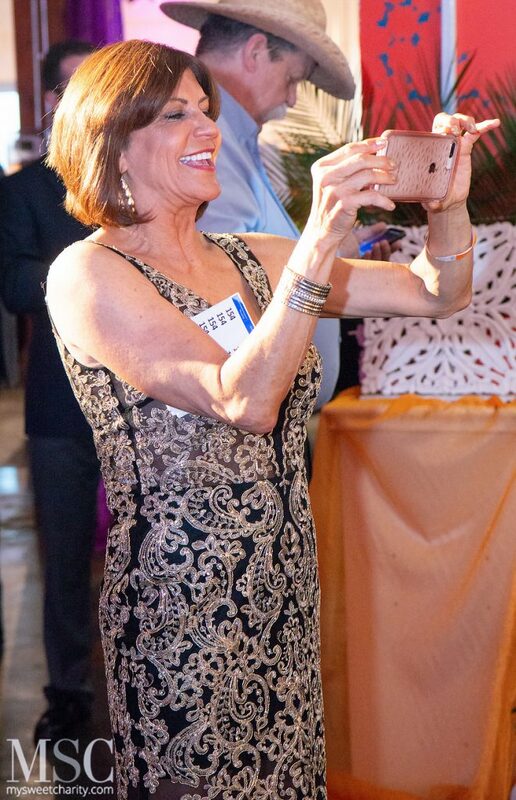 Girls Night Out: Honorary Co-Chair Cindy Thomasreported that husband/Honorary Co-Chair Bert Headen was on the mend after a week in the hospital… Debbie Robinson was sans husband Robin Robinson, who was recovering from surgery performed the week before. In the crowd: Equest Founder Susan Schwartz taking cell-photos, Paul Coggins, Pat Holder and Wayne Ritter checking out the silent auction; 2018 Equest Fashion Show speaker Alex Salser posing with the mini-ambassadors; Sue and Ben Casey, Jo and John Gudjohnsen with Jane and David Hardenbergh, Peggy Sewell, Rusty Duvall, Cara and Jim French, Kimber and Michael Hartmann and Phyllis Glazer, plus Jennie Reeves with granddaughter Stella Wrubel. Following the cocktail reception, the curtains were pulled back and Arthur Murray dancers showed the way into a dining room for the seated, three-course dinner. According to Louise’s game plan, the highlight of the evening was to be the inaugural presentation of the Citation Award to Connie and Denny. Upon presenting the award to the Carrekers, Equest CEO Lili Kellogg explained that the evening’s Arabian theme was appropriate for the Carrekers’ receiving the award, since they had previously raised Arabian horses. A very caught-off-guard Louise received the award from Annie and Teal as the room full of guests applauded the announcement with a standing ovation.